Yogavana hills is located Just 34kms From Bangalore City, on Kanakapura - Bangalore Highway( National Highway 209) Just 3 kms From Highway near Gollarapalya Village. on the road to Bidadi and Just 12 Kms From Ravishar Guruji's Art Of Living and 20 kms From Bannerghatta National Park. 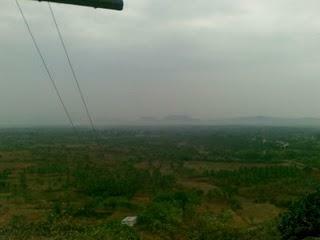 Yogavana Hill is an easy to climb, it has a small temple on top Narasimha Swamy temple,and offers great views. Drive from Kanapura road is through paddy fields to the hill. The Sri Siddhalingeshwara Yogavana Hills Ashram is at the base of the hill. This Ashram is a registered charitable society, under Karnataka state registration of service act 1961 (KSR Act 1961).The prescribed government vide number SOR/13/2001-2002, Dated 8-5-2001. Sri Siddhalingeshwara Yogavana Hills Ashram Conducted Personality Development Camps at various locations in the state,Conducted Health Development Camps,Herbal Treatment Camps for chronic diseases also pursuing researches on jungle herbs for the same,Built rainwater harvest structures and check dams,Forestation of the waste lands around our hills,Conducted Peoples Awareness Program,Distribution of books, pencils, pens and shoes at rural schools.Brochures about duties and responsibilities in the local language distributed among villagers,Natural building materials used for our structures, Self healing programs. Yoga Vana Hills is a NGO recognized by the government. The organization falls under Tax Exemption Act under Section 80G.It has permission granted for the acceptance of foreign funds. This place offers Peaceful Green Surroundings for a quick get-away from Bangalore. this is the very beautiful place. 29th Km, Kanakapura Road or Biadi cross from mysore road, Bangalore-560082.